>I knew it! Thanks for settling a debate that's gone on for years. I'd split the winnings…but it's only a soda. Sorry, I'm not a big gambler. >That's awesome. Truly awesome. My husband said you have ruined that song for him. Bahaha. >lol – wow! It has taken me some time to connect with your sense of humor (and that's only because I've been short on time and humor lately! ), but once I got it, WOW. I don't usually giggle out loud when I'm cruising online. This is the second time in two days. You're awesome. Thanks for the laugh. 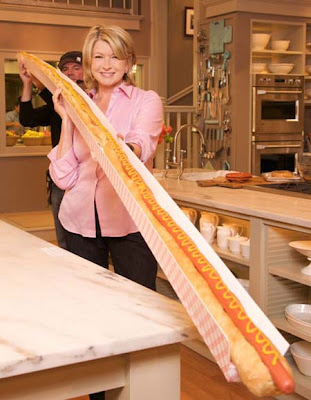 >I don't care for hotdogs or martha stewart…hahaha! >Finally! The truth after years of listening to that song while waiting for customer service to pick up! Hot dogs go on. But customer service never does. >I'm here because someone promised a tribute to the hot "day." I'm so cold. I'm going back to my picture of Tahiti now. >This might be one of my new favorite songs. I do love hot dogs.